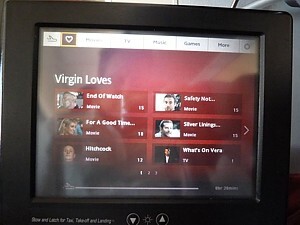 News: Virgin Atlantic now turn on the AVOD inflight entertainment system from before take-off right up until you disembark. This gives you an extra 2 hours to watch films: however you must remember to bring your own headphones to watch before headphones are handed out in the cruise, or you must be assertive to refuse to hand back the in flight headsets when they are collected an hour before landing. 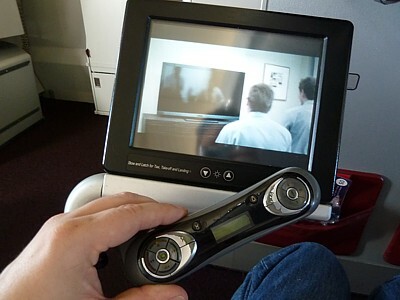 All cabin classes on all Virgin Atlantic aircraft offer personal seat-back televisions, but not all offer AVOD (Audio Video on Demand), and the oldest aircraft also have the tiniest seatback screens you'll ever see, at 1.2 inches across. Blurred and fuzzy after many years use, you may prefer to snooze instead. Upper class seats have a huge video screen - but its screwed onto the seat in front, so watching it can be an entertaining experience in neck-ache. Indeed, Virgin Atlantic pioneered seat-back personal TVs in all classes back in the 1990s, and you'll still get some passengers who insist on flying Virgin because they like to watch film - most other airlines offer AVOD too now, but it doesn't stop Virgin from shouting about theirs - which is odd, as on some of the older A340s IFE is decidedly old fashioned. 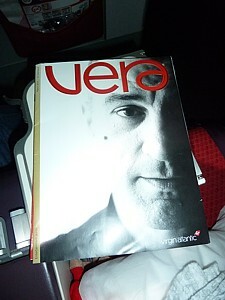 There are various different types of inflight entertainment (IFE), but all are now called VERA. You may see references to older systems such as JAM and V:Port - these are superseded. Most aircraft have an Audio/Video on Demand (AVOD) system called VERA On Demand. This is fitted to all Virgin Atlantic Boeing 747-400s, all Virgin Atlantic A340-600, but only one of the Airbus A340-300. This was originally called V:Port. 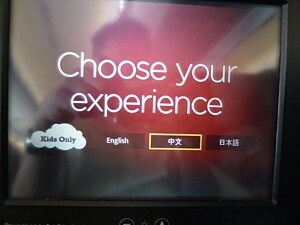 When the system loads you will see a welcome screen, with four langague options: if you have to select the language by selecting it with cursor keys, you know you have VERA on Demand on this aircraft. Incidentally, beware of selecting the wrong language - it's hard to set it again without a system reset. All of the other old A340-300 aircraft have VERA Reel where the films are shown on an old fashioned tape loop. All of the new A330-300 aircraft and the Boeing 747-400s out of Gatwick & Manchester have the new touch screen AVOD system called VERA Touch - this was originally called Virgin Jam (or V:Jam), and you may still see references to it. Two other styles of IFE that Virgin once had are Arcadia (old 747-200s) and Nova (on Airbus A340-300 aircraft). Neither exist any more. 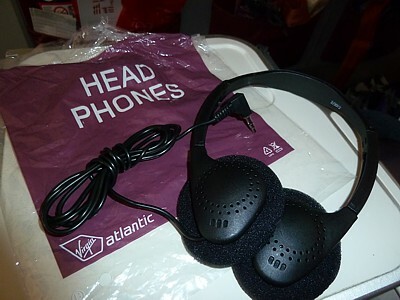 In economy and premium economy, Virgin Atlantic headphones are identical. They are of the overhead headband type, with a single 3.5mm pin stereo jack. The single 3.5mm jack plug often works loose, and it can provide a neat way to combat boredom - trying to get the thing to work in both ears. On a few flights out of Manchester you may see the older type of Virgin Atlantic Headphones which are rather uncomfortable sit in the ear type things, in white. Alas audio is strictly mono. Headphones in business class are good chunky ones, with a single 3.5mm pin, however they are not noise reducing headphones. Due to the poor quality of Virgin Atlantic headphones, it is well worthwhile remembering to bring your own headphones. This also means you can watch video on the ground, with the AVOD system turned on before headphones are handed out in the cruise. Headphones are collected an hour before the flight lands - you must be assertive to refuse to hand back the in flight headsets when they are collected if you want to carry on watching vilms. VERA On Demand is a pretty normal Audio Video on Demand Inflight Entertainment System (AVOD). The VERA On Demand systems offer a choice of around 40 full length feature films, 60 audio CDs, and around 50 hours of television shows. Other than that, it is a pretty normal airline AVOD IFE (Audio Video on Demand Inflight Entertainment System) which allows you to stop, start, pause and rewind films on demand. Compared to some other airlines, the VERA AVOD system doesn't offer as many films as you might expect. Indeed, the choice of films changes once a month, and because there isn't that much space on the discs for these machines, films generally have a one month lifetime - if your return flight is the next month, the film you didn't finish is unlikely to be there. Even the cheap seats have playstation games on the seatback video, and there is a good selection of ones to play, but beware that the some of the controls (again on the oldest aircraft) are getting a bit tired. Some of the games can be played competitively against other passengers. The controls on the remote are annoying. Although there are perfectly good buttons on the remote for play and pause, they are ignored by the AVOD controller, and you have to navigate by moving the cursor over the play, pause button etc. 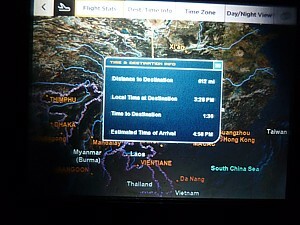 There is a good moving map, but it takes a long time for the display to rotate to how much of the flight remains. The VERA On Demand system is turned on from before take-off right up until you disembark. This gives you an extra 2 hours to watch films: however remember to hang onto your headphones - the crew like to whip them away the second the aircraft descends, if you them lying around. Vera Reel Video on tapeloop. The reason for the confusing on screen controls using the cursor is clear when you use the new touch screen AVOD system called VERA Touch. 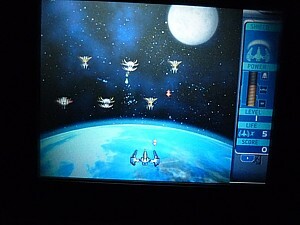 Here, you just use the touchscreen to play and pause, and it has a common screen interface with VERA on demand. Other than that it is the same system, but with slight more capacity for storing films. There are more, and releases from last month may still be on the system. Bad luck if you are on an Virgin Atlantic Airbus A340-300. These old aircraft have video on a tape loop, with just 12 channels, of which six are films, and the rest TV programmes and the moving map. Virgin Atlantic have mad major savings by not producing an inflight magazine for many years. Instead, you'll find two magazines in the seatbacks - neither of which are a very good read. You're expected to watch telly instead. Retail Therapy, is just an inflight shopping cataloge. 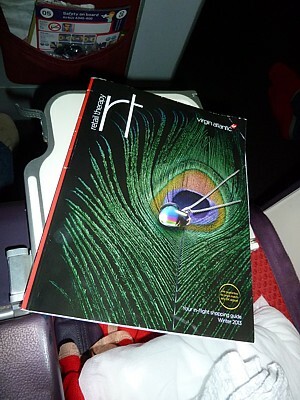 The design is quite trendy, but the content anything but: the only real 'contents' for want of a better word are the last few pages where there is a route map, details of Virgin's latest news, and details of the snacks and classes on board. Vera Magazing (published all the way out in Kidderminster) is the entertainment guide listing the TV programmes, and tt has the worst laid out film section you'll ever see, with long lists of descriptions of films - that quite often aren't loaded onto your aircraft - or generic descriptions of TV programmes that tell you nothing about the actual contents of the episode you are about to watch.